Late last week I finally got a two day break from this magazine craziness. Early Thursday morning my studio assistant Mike and I got on the road to head down to the Yale Furniture Study in New Haven, CT. Even though this was technically a “business” trip it was an immense “pleasure” to be away from my computer screen and M&T mailing responsibilities. This magazine has been a real stretch on my ability to keep it together while being pulled a million different directions by urgent matters. I survived a few months like that but I was beginning to reach a breaking point. This Yale trip was a totally different experience. Road tripping 6.5 hours down the coast with my good friend chatting the whole way was a blast. I was looking forward to this trip because the mission was singular: document and measure a chair. That’s it. 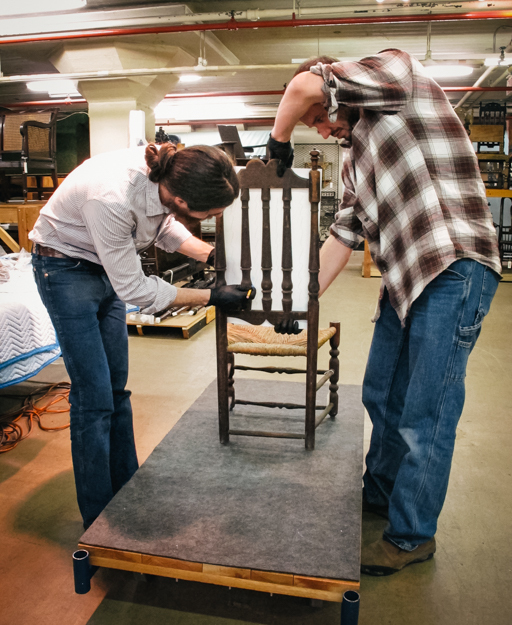 The Yale University Art Gallery has commissioned me to make a reproduction of an 18th century Rhode Island banister-back chair from their collection for an upcoming exhibit. (More about that exhibit here.) This project actually has two parts… Besides the building of a reproduction, they will be sending a film crew up to Maine to film the building process. This footage will be edited into a short looping video to be played at the exhibit. There is even talk about hosting a longer cut of the footage on their website. Stay tuned for those details. Besides our measuring tasks, Mike and I wandered the collection to examine construction techniques and stylistic details on a variety of forms and periods. I always learn so much when I go there. We were struck in particular with the inanity of describing “the” way “they” did it back then. When you examine this many pieces back to back you can’t help but notice how many different ways a form can be constructed. Being there is a wonderful experience like none other I’ve had. If you haven’t gone yet, I encourage you to read the article in Issue One all about the place. Once you make your way through that interview, you’ll be planning your trip to CT. Promise. On the way back up to Maine on Friday, we stopped at Skinner to pick up a piece I won at auction. 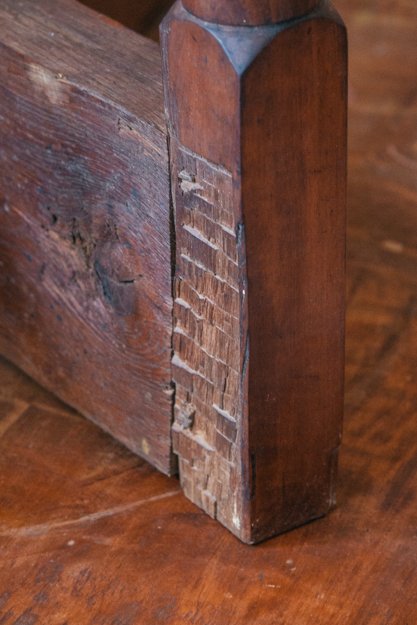 I’ll save details for later but let’s just say this piece will definitely be featured in Issue Two of Mortise & Tenon Magazine because it is a goldmine of 18th century tool marks and construction. It is a great case study for period methodology and has a workmanlike beauty that’s stolen my heart. I also plan to bring the piece to some of my events throughout the year so if you plan on seeing me at any of those, you’ll probably see this piece. When I arrived home Friday night I had gained fresh perspective and new energy for getting caught up on M&T orders and emails. If all goes to plan, by tomorrow evening everything will be caught up completely. Let’s hope. I guessing the new acquisition is a drop leaf Queen Anne table. Congrats on the commission!!!! Let's visit the show when it opens! Already scratching my head at the enigmatic photo of your acquisition. I can't wait to see more. And congrats on the furniture commission from Yale - I've always wanted to build a chair like that!